Anybody ever had their fuel tank collapse? I bought a new gas cap for my TO30 a while back from this site. I would lose a little gas if I filled the tank close to full with the old cap, which is where the stains came from in the pic. I put the new cap on the other day and did a little mowing. Right away I noticed the cap wasn't venting right, I could hear hissing coming from the cap. I stopped the motor and there was alot of pressure in the tank when I removed the cap. I decided I would bring the old cap with me next time and put back on. My tractor is several miles from my home, and I hadn't been out there for over a week until last night. I opened the hood and the tank was collapsed. At first I thought it had been vandalized, but I'm pretty sure that's not the case. 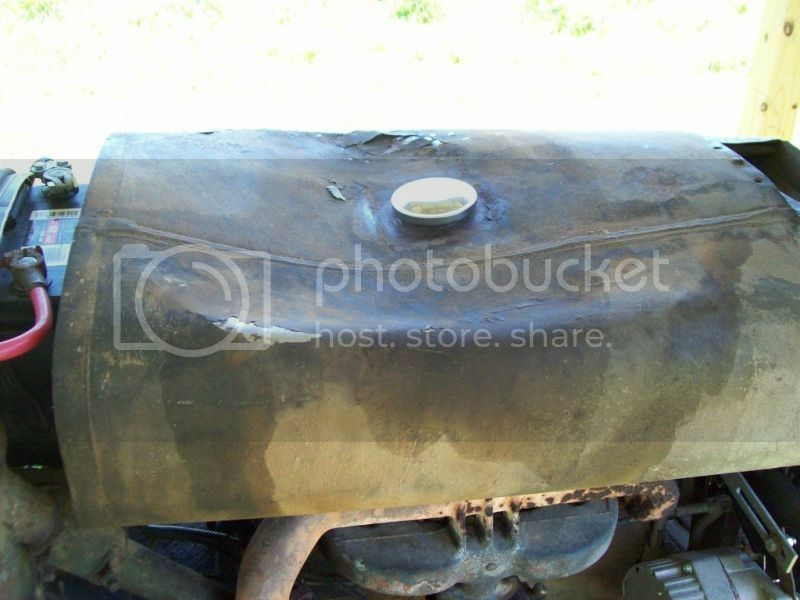 Has anybody ever seen this happen to a steel fuel tank? I've heard of plastic tanks collapsing if the vent was stopped up, much like my plastic gas jug does, but I wouldn't have thought it would happen to a metal tank. The tank is now leaking from where the sediment bowl assembly attaches. I'll clean it up tonight and hope that it's repairable. I think a new tank would cost $200 or more, I'd hate for a $8 gas cap to cost me that much. I see that parts on this site have a 1 year warranty, I wonder if it will cover this...I won't hold my breathe. BTW, that's just paint that is cracked and chipping off in the picture. I'm guessing our fine EPA has something to do with vented gas caps. I too bought supposedly vented cap (it had a sticker "vented" on the cap) at a local parts house and it also pressurized the tank. So far, I haven't had any trouble with it. I'm wondering if they are partially vented to keep most of the fumes from going into the atmosphere.? My question is why does this site sell a non vented cap for this tractor. It says in the part description replaces OEM 520948M91. The original was vented, since I thought it was OEM I never even looked at the new one just put it on. Well, 14.7 psi collapsed it. I wonder if you took it off, used a pipe plug where the fuel filter attaches if you could use an air compressor and pressurize it to pop it back out. Drain all fuel of course. that you will never get to the point of a tank issue. Quoting Removed, click Modern View to seeSame collapse to a 55 gallon barrel which was about 2/3 full, last winter. I had it happen on a VW Rabbit diesel when it ran out of fuel but the gauge said 1/2 full. installed a inner tube valve on an old fuel tank cap and put a little compressed air to it. It popped right back. The trick is not to use too much air. You could rupture the tank. Just go nice and easy. Gas tank was warm, install new non venting cap. Tank cools off and collapses due to non venting cap. Wanna have some fun? Get a one gallon metal gas can, pour in about a cup of water, put on open flame and get water boiling. Remove from flame and instantly screw on cap tightly. Let cool. Can will collapse before your eyes. Wanna put it back? Put can tank in freezer for a few hours, open door, install same non venting cap, put outside in the sun and let expand. SNAP!, CRACLE!, POP! And when the fuel cooled down and created a near vacuum, the tank collapsed. Haven't heard of that happening on a Fergy before but I have heard of other fuel tanks collapsing. The fuel cap is not vented. Not only fuel tanks, all kinds of them that were not vented or vents froze up. Happens allot, doesn't matter. Plastic, steel or aluminum. I drive by a 2500 bbl tank everyday that has been collapsed because of venting issue's. Most interesting article, but at some point i guess it sucked! !